Abstract: Educational leadership in madrasah is one of education management functions. Madrasah is a formal religious education institution which provide educational services to the public. The quality of education in madrasah can be known one of them through the performance of madrasah leadership and vice versa. This research focused on madrasah leadership in building communication with stakeholder based on Sunnah Prophet Muhammad saw. This research uses qualitative approach with post-posivistic and phenomenology paradigm with multicase design. The findings empirically in communication the head of madrasah leadership in establishing communication with sakeholders is: (1) to establish cooperation relationship with stakeholders element; (2) silaturrahim structured activities; (3) into the motor changes madrasah progress; (4) spiritual orientation and social capital to achieve financial and human capital; (5) together work based on the principle of expediency; (6) taboo to discuss about salary and position and embarrassment show property and property ownership; (7) position is trust and not purpose; (8) firmly in giving sanction; (8) supervision of madrasah culture background; (9) time and work discipline; (10) build relationships with graduates through programmed activities. Abstract: The idea of Umer Chapra in building Muslim civilization was based on his research on the position of Muslims who from time to time more and more felt strange with the civilization and Islamic values itself, even the civilization was gradually increasingly eroded and marginalized by Western culture. He tried to restore the Muslim position which should be done as the Messenger of Allah had pointed out, and their positive role in building civilization. The Islamic civilization has the power that lies in the development of morals and material strength. For Chapra, the moral development without being integrated with the economic development cannot be realized. And at the same time, this economic development must also have a worldview and strategy that is in line with religious objectives (maqashid asy-syari’ah). The development of Muslim civilization requires the transformation of human beings and their institutions, focusing in the increasing of education and personality development, and the simultaneous mobilization of material, economic and technological resources for the rearrangement of community structures over the principles of deliberation and accountability, unity, independence and justice. Abstract: Wahdatul Wujud or Unity of Being is a sufi doctrine that is in accordance with the well-known, inclusive and permissive views of the people of Nusantara. The teaching has proven to be an important part in realizing the peaceful and harmonious civilization of the Islamic archipelago. Unfortunately when orthodox theology doctrines which nuanced exclusive and radical dominated the Muslim intellectual discourse of archipelago, the doctrine of Wahdatul Wujud become excluded and even terminated from the stage of Islamic intellectualism of archipelago. This paper wants to evaluate critically the work of Ibrahim Kurani, Ithaf ad-Dhaki bi Shahr at-Tuhfah al-Mursalah ila an-Nabi which was written intentionally to explain the papers of Muhammad Fadhullah al-Burhanpuri entitled at-Tuhfah al-Mursalah ila an-Nabi Which discusses the teachings of Wahdatul Wujud that had been spread in the archipelago. This Ibrahim Kurani’s works is necessasry to be evaluated though it is generally accepted as the synthesis of Wahdatul Wujud according to orthodox theology, but factually it has a very significant role in reducing this doctrine so that Wahdatul Wujud becomes a foreign doctrine in the archipelago. 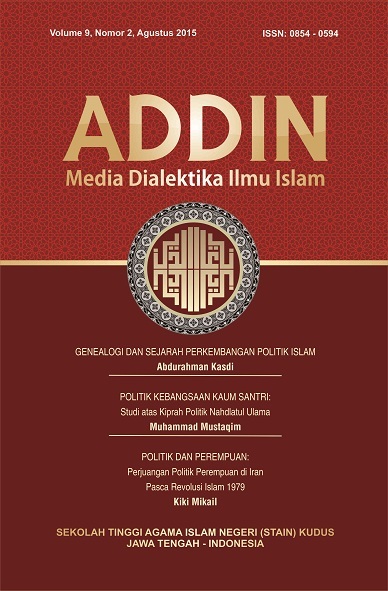 In this study the authors found some epistemological and academic error committed by Ibrahim Kurani to the doctrine of Wahdatul Wujud in his book. The author expects Wahdatul Wujud could be revived in scientific and academic discourse as a solution to counter the teachings of exclusive and radical Islam in order to realize a peaceful and democratic Islam as had happened in the history of Islamic civilization in archipelago. Abstract: This research aims to develop and test the construct validity of the tadzkiyatun nafs instrument at the Tarbiyah and Teacher Training Faculty of UIN Raden Intan Lampung. The Population of this research was the students of Tarbiyah and Teacher Training Faculty that consisted of 150 students. The method employed in this research was survey technique by using Likert Scale parameter. The result of the empirical research states that 37 items of the Tadzkiyatun Nafs instrument are spread out into five dimensions. The result of construct validity by using factor analysis proved that several numbers of items that have been estimated are 37 indicators with the value of > 0.30, out of 39 items, assuming that all items are estimated in accordance with the theory being constructed. The two other indicators are < 0.30 which then eliminated. The two items that were eliminated are item A4 on the Tauhid dimension, and point A11 on the shalat dimension. The implications of this research are expected can contribute to the progress of Islamic civilization, especially in relation to scientific integration by integrating Islamic sciences as its subject, and exact science as its methodology.